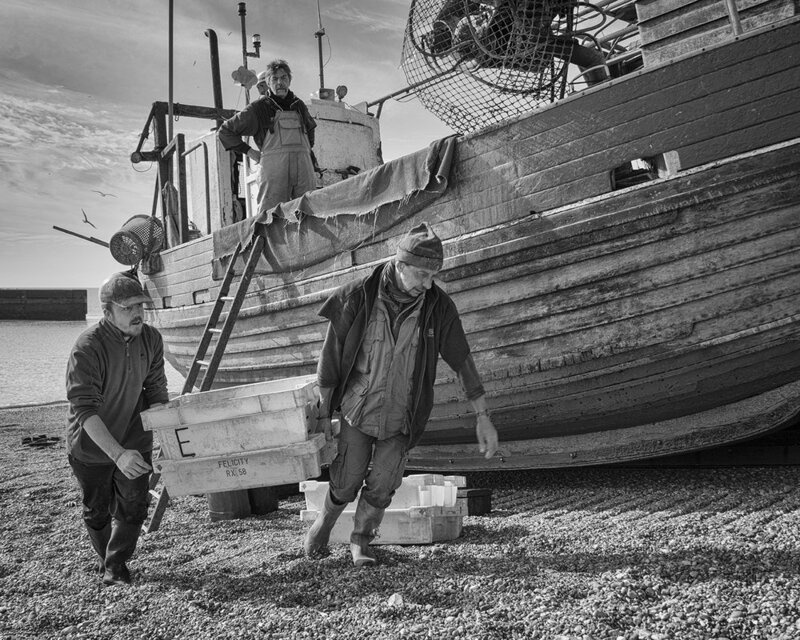 My five images tell the story of the hard work involved in being a fisherman on the Stade, Hastings. There is no harbour here - the boats are launched and hauled back onto the shingle by bulldozers. Until 1989 this was carried out manually with the help of men based onshore, still known as 'boy ashores'. Boy ashores are mechanics , they drive the bulldozers, help to mend the nets, and some sell fish fish from the small huts on the Stade. Each fishing boat has its own black hut with a winch, where nets and other paraphernalia are stored. In my pictures, you can see one of the boats resting on the shingle with the skipper watching his mates carrying part of the day's catch off to market. In two other pictures, one boy ashore skins a dogfish and another mends nets. The picture of the three fishermen with RX55 shows them stripping out the small, unwanted fish from the nets to ensure they have been thoroughly cleaned before re-use. And, the picture of the fisherman in his hut shows him making new floats, in the company of a non-fishing friend.